Firstly can i say that i have been silent for a while. This is for a few reasons, the usual being as busy as a bee in summer and secondly being hit by a virus that has knocked me out for the past week. The children got it first and managed to only feel ill for a couple of days. I am on my fourth and feel worse than yesterday - hows that fair?! My answer to all ills and some some non ills is a bath.... stressed? Have a bath. Headache? have a bath. Tummy ache? Have a bath? Infact tired, fed up, ...you get the picture. I thin my children must get sick of me saying it. But is their anything better when feeling a little poorly than to have a big bubble bath run for you? Also lots of lounging about on the sofa in front of rubbish tele is quite theraputic. 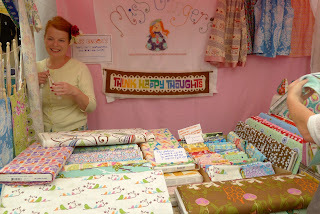 I did manage to do the stall and have met up with two fellow bloggers. It was great to put faces to names, especially as they have such great blogs. Hope you're soon feeling much better. You and your stall look great in the photo! That's kids for you - give you their disgusting lurgies and then miraculously get better and demanding just as you feel appalling! Hope you feel better soon. Darling! thank you so much for the suprise parcel this morning, what a lovely lovely and unexpected treat! I am over the moon, thank you! Agree totally about the bath thing! You stall looks great hope you start to feel great soon. Your stall looks great, hope you feel better soon :) I agree with you a bath does solve a lot of things!